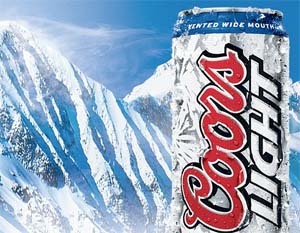 Clifton Vial from Alaska, who was stranded in snow for three days at temperatures of 1.4 F (minus 17 C), has survived by eating frozen Coors beer. Clifton Vial became stranded in his Toyota Tacoma 40 miles outside Nome, Alaska after plunging in a snow drift. Uncharacteristically unprepared for the situation, the 52-year-old was wearing jeans and a thin coat – not protective enough to dig himself out of the snow without getting frostbite. With no signal on his cellphone, Clifton Vial had to sit and wait for his colleagues to realize he was missing. Clifton Vial kept warm in a fleece sleeping bag and by wrapping a bath towel around his feet, and would occasionally start the truck to run the heater. He stuffed rags in his clothes and unraveled tissue paper, pushing it down around his feet. After searching the truck, Clifton Vial found only three cans of frozen Coors Light. “I cut the lids off and dug it out with a knife. Clifton Vial said the cold was more unbearable than the hunger. “When I was just sitting there in my coat in the sleeping bag liner I would pull my arms inside my T-shirt to try and utilize my body heat as much as I could,” Clifton Vial said. Clifton Vial’s wife and daughter were out of town and he feared he would never see them again. “I tried to sleep when I could, but I knew that I might not wake up,” he said. When he failed to turn up for work the next day, co-workers patrolled the area – and alerted the police when he failed to show up for a second shift. Troopers joined the search. Rescuers looked for Clifton Vial on the ground and from the air, in planes and from a helicopter. “When we get called on situations like this, it’s a needle in a haystack,” Jim West Jr., a Nome fire department captain and search and rescue coordinator, told the Anchorage Daily News. More than 40 miles out of town, at about 9:30 that night, Clifton Vial’s pickup plunged into a snowdrift. Three days after he first became stranded in the snow, rescuers pulled up behind his pick-up. They gave him a Snickers bar – it seemed too dry to eat – and an orange soda. Clifton Vial planned to visit a doctor Friday afternoon, then return to work. He showed no signs of frostbite.